The aim of this study was to assess the clinical outcomes of palliative interventions for patients with incurable locally advanced or metastatic esophageal carcinoma. A total of 131 patients with thoracic esophageal carcinoma who underwent palliative interventions were enrolled. Insertion of a self-expandable metallic stent (SEMS), tube enterostomy for enteral nutrition (EN), and palliative esophagectomy (PE) were performed in 38, 65, and 28 patients, respectively. The clinicopathological characteristics and clinical outcomes of each group were retrospectively reviewed. Patients in the EN group frequently received chemoradiotherapy (P < 0.01). 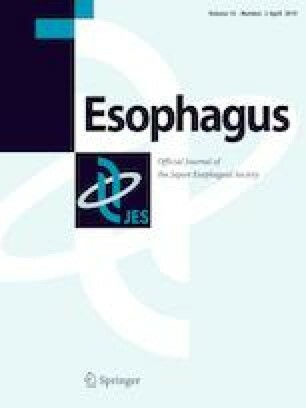 SEMS insertion, but not PE or EN, improved the mean dysphagia score after the intervention (P < 0.01). For the SEMS, EN, and PE groups, the occurrence of intervention-related complications was 31.6, 10.8, and 96.4%, respectively, the median survival time was 88, 208, and 226 days (P < 0.01), and the mean ratio of duration of home care to survival time was 28.9, 38.5, and 39.6% (P = 0.95). SEMS insertion effectively relieved obstructive symptoms, but had no survival benefit. Tube enterostomy showed a low complication rate and has the potential to improve survival in combination with additional treatment, with no palliation of obstructive symptoms. Informed consent or substitute for it was obtained from all patients for being included in this study.